These helicopter swivels have been manufactured specifically for Nash and have a low glare, no-spook finish. They show unrivalled strength, durability and reliability and are free-running to optimise the renowned anti-tangle properties of helicopter rigs. 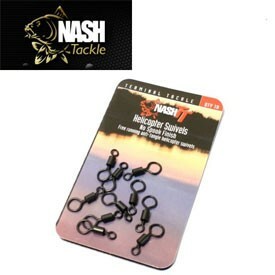 FREE Delivery on all Nash Swivels & Clips over £100!! !